This study aims to examine: (1) the influence of procedural fairness to participative budgeting; and (2) the influence of procedural fairness to participative budgeting through organization commitment.The purpose of descriptive research method used in this study is to obtain a description of the characteristics of the variables and then verification is applied to determine the relationships between variables through hypothesis testing. The population in this research is 165 officers in 55 Local Government Unit Agencies (SKPDs) in West Java Province. Validity and reliability of questionnaires are tested before examining the hypotheses. Structural Equation Modeling (SEM) is used as the analysis technique in this research.The research findings are as follows: (1) procedural fairness hasa positive effect on the participative budgeting; and (2) procedural fairness has a positive effect on the participative budgeting through organization commitment. Allen, N.J., dan J. P. Meyer. 1990. The measurement and antecedents of affective, continuance and normative commitment to organization. Journal of Occupational Psychology. Vol.63: 1–18. Aquino, K., M. U. Lewis, dan M. Bradfield. 1999. Justice constructs, negative affectivity, and employee deviance: A proposed model and empirical test. Journal of Organizational Behavior. Vol.20: 1073–1091. Brownell, P. 1982. The role of accounting data in performance evaluation, budgetary participative and organizational effectiveness. Journal of Accounting Research. Vol.20 (Spring): 12-27. ______and M.Hirst. 1986. Reliance on accounting information, budgetary participation, and task uncertainty: Tests of a three-way interaction. Journal of Accounting Research. Vol.24 No.2: 241–249. ______and M. McInnes. 1986. Budgetary participation, motivation, and managerial performance.The Accounting Review. Vol.56 No.4: 587– 600. ______and A. Dunk. 1991. Task uncertainty and its interaction with budgetary participation and budget emphasis: Some methodological issues and empirical investigation. Accounting, Organizations, and Society. Vol.16: 693-703. Bryan, J. F., dan E. A. Locke. 1967. Goal setting as a means of increasing motivation. Journal of Applied Psychology. Vol.53 No.3: 274-277. Campbell, D. J., dan K. F. Gingrich. 1986. The interactive effects of task compexity and participation on task performance: A field experiment.Organizational Behavior and Human Decision Processes: 162-180. Chenhall, R. H., dan P. Brownell. 1988. The effect participative budgeting on job satisfaction and performance: Role ambiguity as an intervening variable. Accounting, Organization, and Society. Vol.13 No.3: 225-233. Chong, V. K., dan K. M. Chong. 2002. Budget goal commitment and informational effects of budget participation on performance: A structural equation modeling approach. Behavioral Research In Accounting. Vol.14. Cherrington, D. J., dan J. O. Cherrington. 1973. Appropriate reinforcement contigencies in the budgeting process.Journal of Accounting Research (supplemen):225-253. Conlon, D. E. 1993. Some tests of the self-interest and group-value models of procedural justice: Evidence from an organizational appeal procedure. Academy of Management Journal. Vol.36: 1109-1124.
Cooper, D. R., dan P. S. Schindler. 2006. Business Research Methods. Ninth Edition. International Edition. Mc Graw Hill. Cropanzano, R., dan R. Folger. 1991. Procedural Justice And Worker Motivation. In R. M. Steers & L. W. Porter (Eds.). Motivation And Work Behavior5th Ed. New York: McGraw-Hill. Dellaportas, S., K. Gibson, R. Alagiah, M. Hutchinson, P. Leung, dan D. V. Homrigh. 2005. Ethics, Governance & Accountability A Professional Perspective. John Willey & Sons Australia Ltd.
Dossett, D.L., G. P. Latham, dan T. R. Mitchell. 1979. The effects of assigned versus participatively set goals, KR, and individual differences when goal difficulty is held constant. Journal of Applied Psychology. Vol.64: 291-298. Hope, J., dan R. Fraser. 2003. Beyond Budgeting: How Managers Can Break Free from the Annual Performance Trap. Harvard Business School Press. Boston. Massachusetts. Fryxell, G. E.1992. Perceptions of justice afforded by formal grievance systems as predictors of a belief in a just workplace. Journal of Business Ethics. Vol.11 No.8: 635-647. Greenberg, J. 1986. Determinants of perceived fairness of performance evaluations. Journal of Applied Psychology. Vol.71: 340–342. Hair, J.F., W. C. Anderson, B. J. Black, R. E. Babin, Anderson, dan L. R. Tatham. 2006. Multivariate Data Analysis. Sixth Edition. Pearson Education International. Harrison, G. L. 1992. The cross-culturally generalizability of the relation between participation, budget emphasis and job-related attitudes. Accounting, Organization, and Society. Vol.17 No.1: 1–15. Ivancevich, J. 1976. The effects of goal setting on performance and job satisfaction. Journal Of Applied Psychology(October): 605-612. Kaplan, R. M., dan D. P Saccuzo. 2005. Psychological Testing, Principles, Aplications, and Issues. SixthEdition. Thomson Wadsworth, Belmont USA. Kenis, I. 1979. Effect of budgetary goal characteristics on managerial attitudes and performance. The Accounting Review. Vol.54: 707-721. Kinnersley, R. L., dan N. R. Magner. 2008. Fair governmental budgetary procedures: Insights from past research and implications for the future. Journal of Public Budgeting, Accounting, and Financial Management. Vol.20 No.3: 355-374. Kline, R. B. 2011. Principles and Practices of Structural Equation Modeling. New York: Third Edition.The Guilford Press. Latham, G. P., dan L. M. Saari. 1979. The effects of holding goal difficulty constant on assigned and participatively set goals. Academy of Management Journal. Vol.22: 163-168. Lau, C. M., dan E. Lim. 2002. The Intervening effects of participation on the relationship between procedural justice and managerial performance. The British Accounting Review. Vol.34: 55-78. ______dan S. L. C. Tan. 2006. The effect of procedural fairness and interpersonal trust on job tension in budgeting. Managerial Accounting Research: 171–186. ______dan A. Moser. 2008. Behavioral effects of non financial performance measures: The role of procedural fairness. Behavioral Research in Accounting. Vol.20 No.2: 55–71. Levanthal, G. S. 1980. What should be done with equity theory? New approaches to the study of fairness in social relationships. Social Exchange: Advances in Theory and Research: 27-55. Libby, T. 1999. The influence of voice and explanation on performance in a participative budgeting setting. Accounting Organization and Society. Vol.24 No.2: 125-137. Locke, E.A. 1984. Goal Setting: A Motivational Technique that Works! Englewood Cliffs.NJ. Prentice-Hall. Magner, N. R., dan G. G. Johnson. 1995. Municipal officials reactions to justice in budgetary resource allocation. Public Administrative Quarterly. Vol.18 No.4: 439-456. Maiga, A. S.,dan F. A. Jacobs. 2007. Budget participation’s influence on budget slack: The role of fairness perceptions, trust, and goal commitment. Journal Accounting Management Research. Vol.5 No.1. Merchant, K. A. 1981. The design of the corporate budgeting system: Influences on managerial behavior and performance. The Accounting Review. (October): 813-829. Milani, K. W. 1975. The relationship of participation in budget-setting to industrial supervisor performance and attitudes: A Field Study. The Accounting Review: 274-285. Mowday, R. T. 1979. The measurement of organizational commitment. Journal of Vocational Behaviour. Vol.14: 224-247. Murtaza, G., I. Shad., K. Shahzad., M. K. Shah, dan A. K. Nadeem. 2011. Impact of distributive and procedural justice on employee’s commitment: A case of public organization of Pakistan. European Journal of Economics, Finance, and Administrative Sciences. Vol.29: 73-80. Nouri, H., dan R. J. Parker. 1998. The relationship between budget participation and job performance: The roles of budget adequacy and organizational commitment. Accounting, Organization, and Society. Vol.23: 467-483. Parker, R. J., dan L.Kyj. 2006. Vertical information sharing in the budgeting process. Accounting, Organization, and Society. Vol.31: 27-45. Robbins, S. R., dan T. A. Judge. 2008. Perilaku Organisasional. Jakarta: Penerbit Salemba Empat. Shields, J. F., dan M. D. Shields. 1998. Antecedents of participate budgeting. Accounting, Organization, and Society. Vol.23 No.1: 49-76. Siegel, G., dan H. K. Marconi. 1989. Behavioral Accounting. South-Western Publishing Co. Cincinnati. Sopiah. 2008. Perilaku Organisasional. Yogyakarta: Penerbit Andi. Staley, A. B., dan N. R. Magner. 2007. Budgetary fairness, supervisory trust, and the propensity to create budgetary slack: Testing a social exchange model in a government budgeting context. Advances in Accounting Behavioral Research. Vol.10: 159-182. Stedry, G. 1960. Budget Control and Cost Behavior. Englewood Cliff, N.J: Prentice Hall.Inc. Subramaniam, N., dan L. Mia. 2001. The relation between decentralised structure, budgetary participation and organisational commitment the moderating role of managers value orientation towards innovation. Accounting, Auditing & Accountability Journal. Vol.14. No.1: 12-29. Suharman, H. 2006. Pengaruh budget emphasis terhadap kinerja manajerial. Jurnal Bisnis, Manajemen, dan Ekonomi. Vol.7 No. 3(Februari). Supriyono, R. A. 2006. Pengaruh variabel perantara komitmen organisasi dan partisipasi penganggaran terhadap hubungan antara usia dan kinerja manajer di Indonesia. Jurnal Ekonomi dan Bisnis. Vol.1 (Februari): 31-45. Tyler, T. R., dan S. L. Blader. 2003. The group engagement model: Procedural justice, social identity, and cooperative behavior. Personality and Social Psychology Review. Vol.7 No.4: 349-361. Wang, K. Y., dan D. Z. Nayir. 2010. Procedural justice, participation, and power distance: Information sharing in Chinese firms. Available at www.emeraldinsight.com. Wentzel, K. 2002. The influence of fairness perceptions and goal commitment on managers’ performance in a budget setting. Behavioral Research In Accounting. Vol.14. Wong-On-Wing, B., L. Guo, dan G. Lui. 2010. Intrinsic and extrinsic motivation and participation in budgeting: Antecedents and concequences. Behavioral Research in Accounting. Vol.22. No.2: 133-153. Yahya, M., N. N. N. Ahmad, dan A. H. Fatima. 2008. Budgetary participation and performance: Some Malaysian evidence. 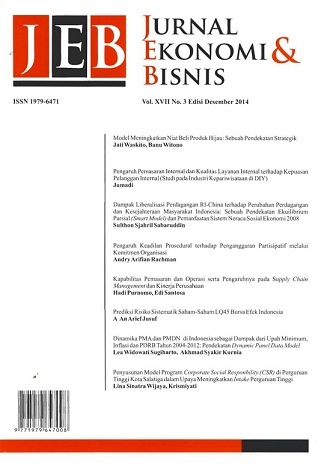 International Journal of Public Management. Vol.21 No.6: 658-673. Yucel, R., dan M. Gunluk. 2007. Effect of budgetary control and justice perceptions on the relationship between budgetary particpation and performance. Journal of Global Strategic Management. (October): 82-93. Zainuddin, S., dan C. R. Isa. 2011. The role of procedural fairness in the relationship between budget participation and motivation. Australian Journal of Basic and Applied Sciences. Vol.5 No.9: 1.464-1.473.